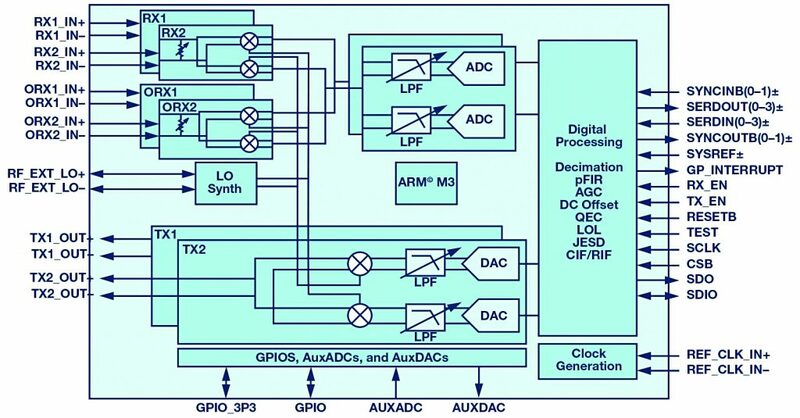 by Peter Delos, Michael Jones, and Mark Robertson, Analog Devices, Inc. In large digital beamforming antennas, dynamic range improvements through the beamforming process of combining signals from distributed waveform generators and receivers is highly desirable. A 10logN dynamic range improvement can be obtained in both noise and spurious performance if the associated error terms are uncorrelated. N in this case is the number of waveform generator or receiver channels. Noise by nature is a very random process and therefore lends itself well to tracking correlated and uncorrelated noise sources. However, spurious signals make it less obvious how to force spurs to be uncorrelated. Therefore, any design method that can force spurious signals to be uncorrelated is valuable to phased array system architecture. In this article we review a previously published technique to force spurious signals to be uncorrelated by offsetting the LO frequencies and digitally compensating for this offset. We then show how the most recent Analog Devices transceiver product, the ADRV9009, has built-in features enabling this capability. We then conclude with measured data demonstrating the results of the technique. 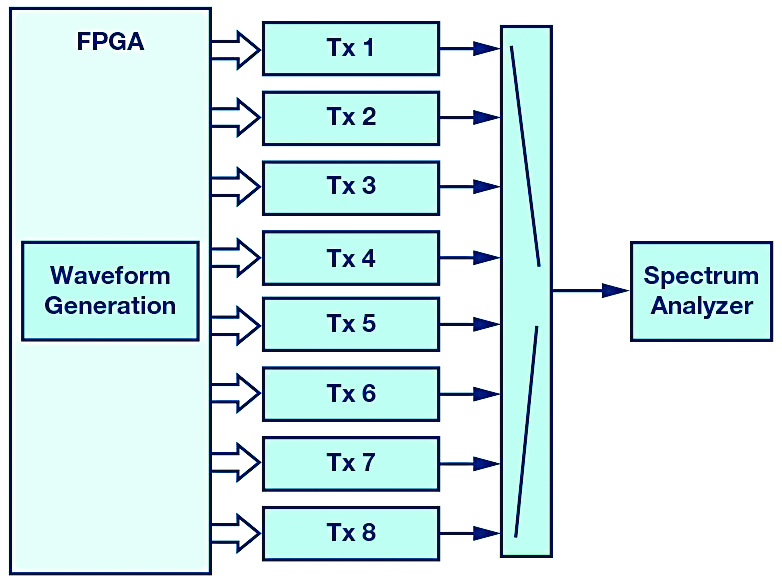 A functional block diagram of the Analog Devices transceiver ADRV9009 is shown in Figure 1. A representative block diagram for an array of waveform generators is shown in Figure 2. In our description, we will describe the method and show data for waveform generators, but the method is equally applicable to an array of receivers. Figure 3: Spectral illustration showing the spurious signals in frequency. 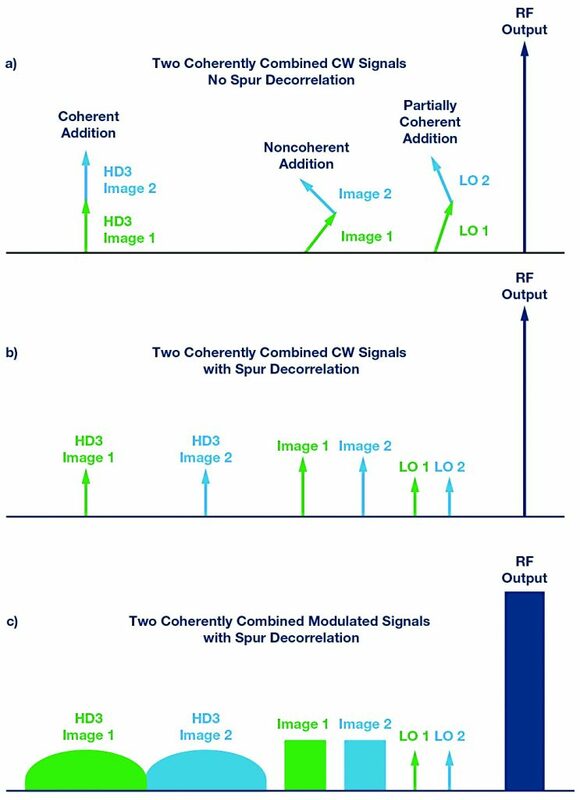 Three cases are shown: (a) two combined CW signals with no spur decorrelation, (b) two combined CW signals with forced spur decorrelation, and (c) two combined modulated signals with forced spur decorrelation. To illustrate the concept in frequency, an example with two transmit signals from a direct conversion architecture is shown in Figure 3. These cases are shown where the RF is on the high side of the LO. In a direct conversion architecture, the image frequency and third harmonic appear on the opposite side of the LO and are shown below the LO frequency. When the LO frequencies are set to the same frequency across channels, the spurious frequencies are also at the same frequencies, as shown in Figure 3a. Figure 3b illustrates a case where LO2 is set at a higher frequency than LO1. The digital NCOs are equally offset such that the RF signal achieves coherent gain. The images and third harmonic distortion products are at different frequencies and thus uncorrelated. Figure 3c illustrates the same configuration as Figure 3b but adds modulation to the RF carrier. An 8-channel, transceiver-based RF testbed was assembled to evaluate the transceiver product line for phased array applications. The test setup for evaluating the waveform generators is shown in Figure 4. For this test, the same digital data is applied to all waveform generators. A calibration is performed across the channels by adjusting the NCO phase to ensure the RF signals are in phase at the 8-way combiner and coherently combine. In Figure 5 and 6, the transceiver NCOs and LOs are all set to the same frequency. In this case, the spurious signals produced from the image, the LO leakage, and the third harmonic are all at the same frequency. 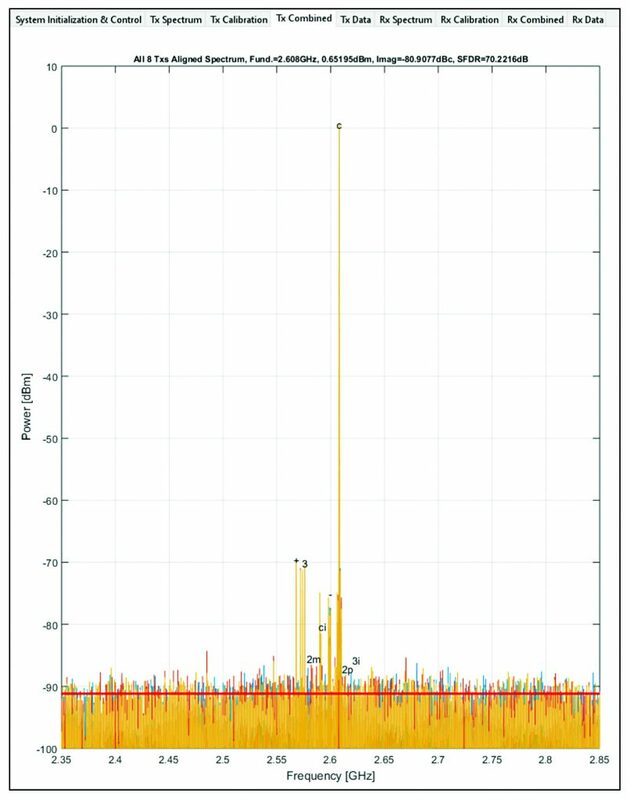 Figure 5 shows the individual transmit outputs measured on a spectrum analyzer. Figure 6 shows the combined output. In this particular test, the spurs of the image and the LO leakage measured in dBc relative to the carrier showed improvement, but the third harmonic did not improve. 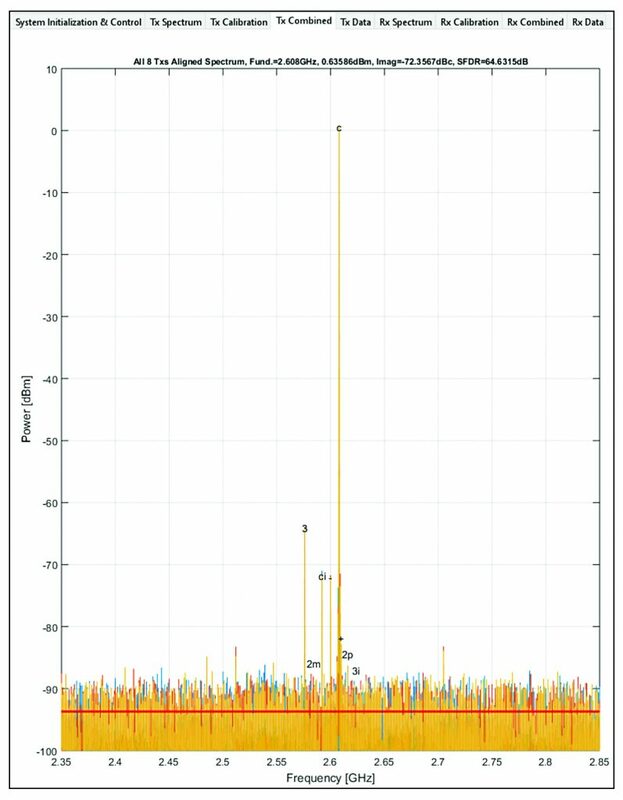 In our testing, we found the third harmonic was consistently correlated across channels, the image frequency was consistently uncorrelated, and the LO frequency varied depending on start-up conditions. This is reflected in Figure 3a, where we show coherent addition for the third harmonic, noncoherent addition for the image frequency, and partially coherent addition for the LO leakage frequency. 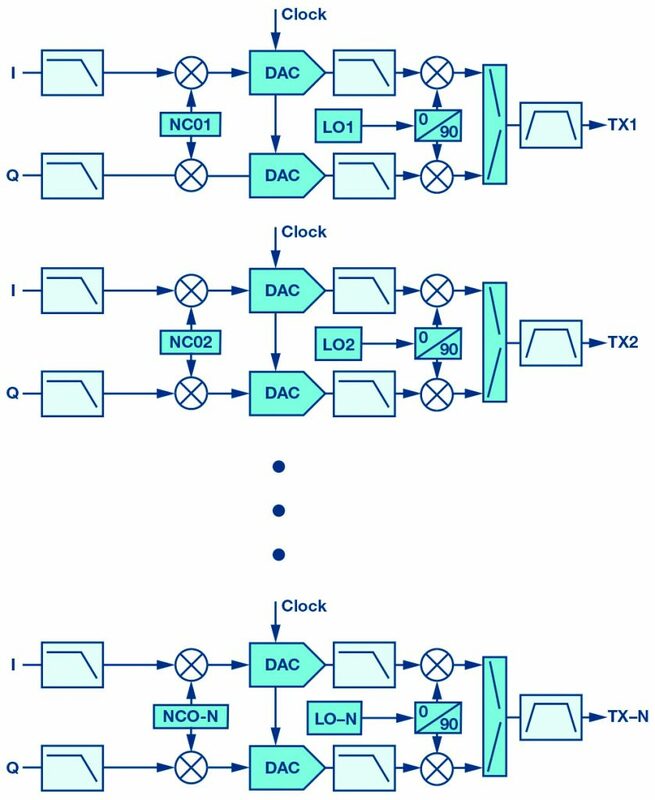 In Figure 7 and 8, the transceiver LOs are all set to different frequencies and the digital NCOs are adjusted in both frequency and phase such that the signals coherently combine. In this case, the spurious signals produced from the image, the LO leakage, and the third harmonic are forced to be at different frequencies. 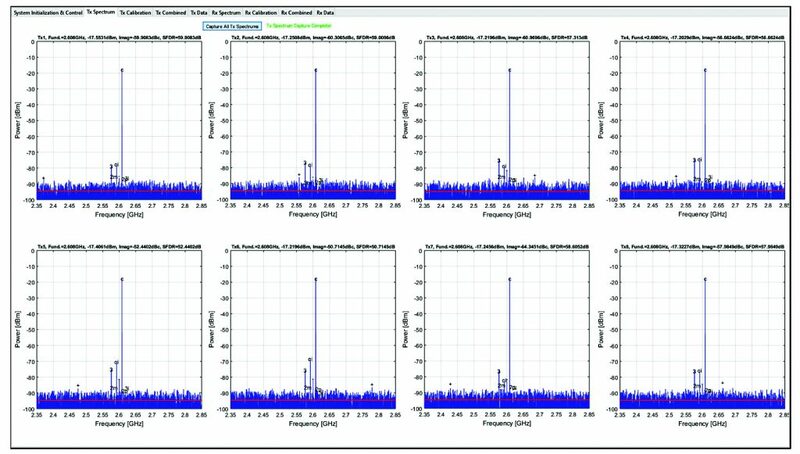 Figure 7 shows the individual transmit outputs measured on a spectrum analyzer. Figure 8 shows the combined output. In this test, the spurs of the image, the LO leakage, and the third harmonic measured in dBc relative to the carrier begin to spread into the noise and every spur shows an improvement when channels are combined. Figure 6: Combined waveform generator spurious with LOs and NCOs set to the same frequency. Note there is no improvement to the third-harmonic spur in this configuration. 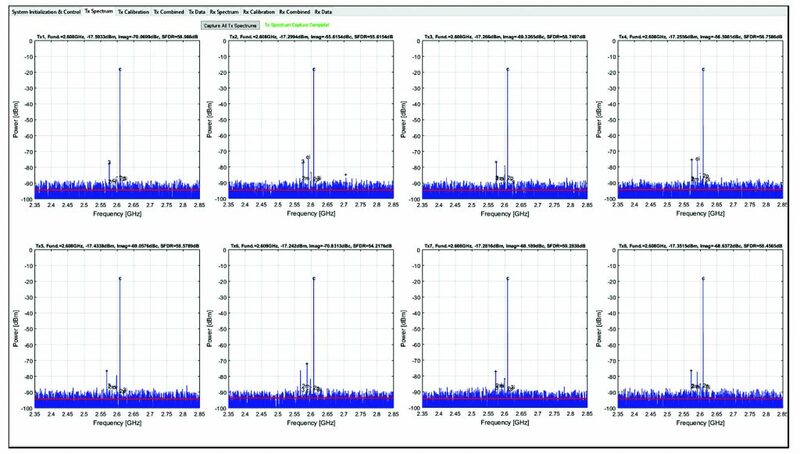 When a very small number of channels are combined, as was done in this test, the spurs actually show a 20log(N) improvement in their relative levels. This is due to the signal components combining coherently and adding as 20log(N) while the spurs do not combine at all. In practice, with a large array and a much greater number of channels being combined, the improvement is expected to approach 10log(N). This is for two reasons. First, with a large number of signals being combined, it will not be practical to spread the spurs out sufficiently such that each one can be considered in isolation. Consider a 1 MHz modulation bandwidth as an example. If a specification says that spurious emissions are to be measured in a 1 MHz bandwidth, then ideally the spurs would be spread out so that they are at least 1 MHz apart. If this is not possible, then each 1 MHz of measurement bandwidth will include multiple spurious components. Since these will be at different frequencies, they will combine incoherently and the spurious power measured in each 1 MHz of bandwidth will increase as 10log(N). However, no single 1 MHz of measurement bandwidth will contain all the spurs, so in this case, N for the spurs is smaller than N for the signal and although the incremental improvement will be 10log(N), once N is large enough for the spurious density to place multiple spurs inside the measurement bandwidth, the absolute improvement will still be better than 10log(N) compared to the system without spurious signal decorrelation—that is, it will be somewhere between 10log(N) and 20log(N) decibels (or dB) better. Secondly, this test was done with CW signals, but real-world signals will be modulated and this will cause them to spread out, making nonoverlapping spurious signals impossible to achieve when a large number of channels are combined. These overlapping spurious signals will be uncorrelated and add incoherently, as 10log(N), in the overlap region. It is worth making special mention of the LO leakage component when the LO is set to the same frequency across channels. The LO leakage is due to imperfect cancellation of the LO in the analog modulator when two signal branches are summed. If the amplitude and phase imbalances are random errors, then the phase of the residual LO leakage component will also be random and when many different transceivers’ LO leakages are summed they will add incoherently, as 10log(N), even when they are at precisely the same frequency. This should also be the case with the modulator’s image component, but not necessarily the modulator’s third harmonic. With a small number of channels being coherently combined, it is unlikely the LO phases would be completely random, and thus the cause for partial decorrelation is shown in the measured data. With a very large number of channels, the LO phase approaches a much more random condition across channels and is anticipated to be an uncorrelated addition. Figure 8: Combined waveform generator spurious with LOs and NCOs offset in frequency. Note in this case that the spurs are spread in frequency and there is a clear SFDR improvement relative to the individual channel SFDR. 1 Lincoln Cole Howard and Daniel Rabideau. “Correlation of Nonlinear Distortion in Digital Phased Arrays: Measurement and Mitigation.” 2002 IEEE MTT-S International Microwave Symposium Digest. 3 Keir Lauritzen. “Correlation of Signals, Noise, and Harmonics in Parallel Analog-to-Digital Converter Arrays.” Ph.D. Dissertation, University of Maryland, 2009. Howard, Lincoln, Nina Simon, and Daniel Rabideau. “Mitigation of Correlated Nonlinearities in Digital Phased Arrays Using Channel- Dependent Phase Shifts.” 2003 EEE MTT-S Digest. Mark Robertson graduated from Cambridge University, UK, in 1990 with a degree in electrical and information sciences. He worked as an RF and analog circuit design engineer for various companies in the test and measurement, cellular phone, and cellular base station industries before joining Analog Devices in Bath, UK as a systems engineer in 2012. He still likes to design real circuits whenever he can. He can be reached at mark.robertson@analog.com.